Happy Scare Day! | My Cup Runneth Over ... and So Does My To Do List! My childrens’ imaginations never cease to amaze me. Sometime after moving to Arkansas, my children started celebrating “Scare Day”. It was something that they created themselves, and each child put in his/her ideas. Tuesday is “Scare Day” in our home. JA is in charge of making the signs. 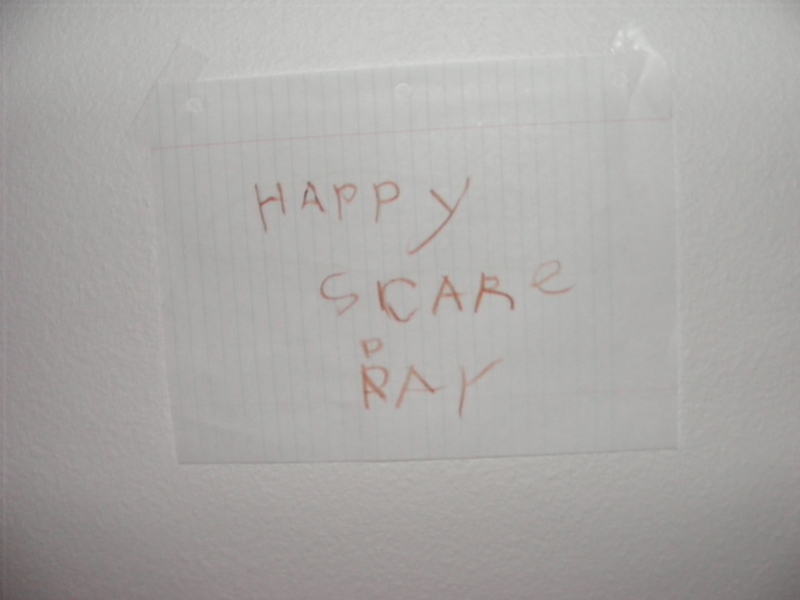 He writes “Happy Scare Day” on pieces of paper and then tapes them to different walls in the apartment. Then GC and IM turn off any light that is on. After all lights are off and all signs are hung, the children find their “hiding” places. When DH or I walk past one of these “hiding” places, whichever child is hiding there, jumps up and shouts “Happy Scare Day”! There is always a lot of giggling and much creativity put into this celebration of sorts! I love watching my childrens’ imaginations come to life! I’m not sure why they felt like we needed a “Scare Day”, or even what made them think to create a “Scare Day”, but they enjoy it so much! And I love that they worked on this project together, as a team! I am so thankful to God as I watch them work together, everyone included, no one left out! Watching their relationship blossom as siblings, and as best friends, brings a smile to my face and my heart! And a Happy Scare Day to the little munchkins! Thanks for your comment on my blog! I just spent some time reading over yours and I love it! I hope you keep it up 🙂 And I don’t know what the old header was, but the new one is really cute!! Thank You, Miriam! I enjoyed reading your blog, as well! I do hope to keep up my blog much more this year than last. We are in the process of moving….again, and I plan to draw a lot of my blog posts from that (i.e. organizing in the “new” home; any remodeling that we do, etc. ).